Health professionals are now much more interested in the well-being of the whole child. When you visit the clinic, you’ll be asked a series of questions to establish how you’re all getting on together, how you’re managing and whether you’ve noticed any specific problems with your baby. Your baby’s physical development will be closely monitored at the developmental checks. 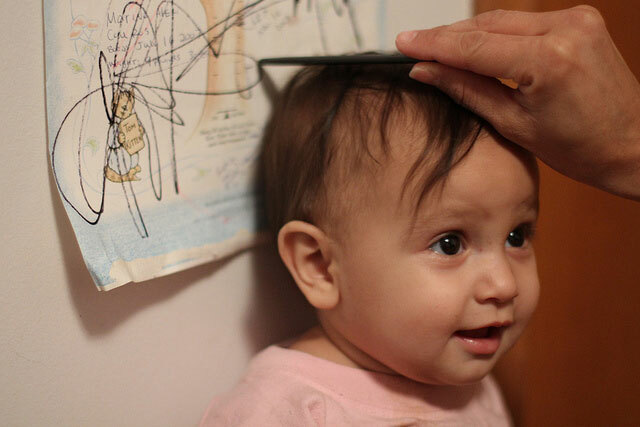 Growth charts, which show the rate of growth expected for your baby’s weight and gestational age at birth, will be used to map her progress. With age, children grow both in weight and height. Their rates of growth are not uniform throughout the whole of childhood. Growth in the first few years of life is very rapid, and then it slows down later. Another spurt of growth takes place in adolescence. Most babies double their birth weight at 5 months and treble it at 1 year. 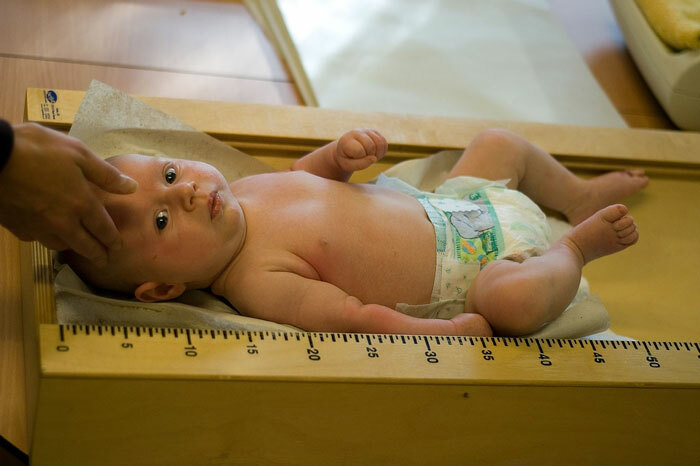 While the average length of the baby at birth is about 50 cms (20 inches), it rises to 75 cms (30 inches) at 1 year, i.e., one and a half times than at birth. If your baby is ill for any period of time, she may lose weight, but she will regain it once she is well. Baby Height and Weight chart month-wise from birth till the age of 2 years (World Health Organisation (WHO) Child Growth Standards) can be found here. Boys, even in infancy, tend to be taller, heavier and grow faster than girls do. 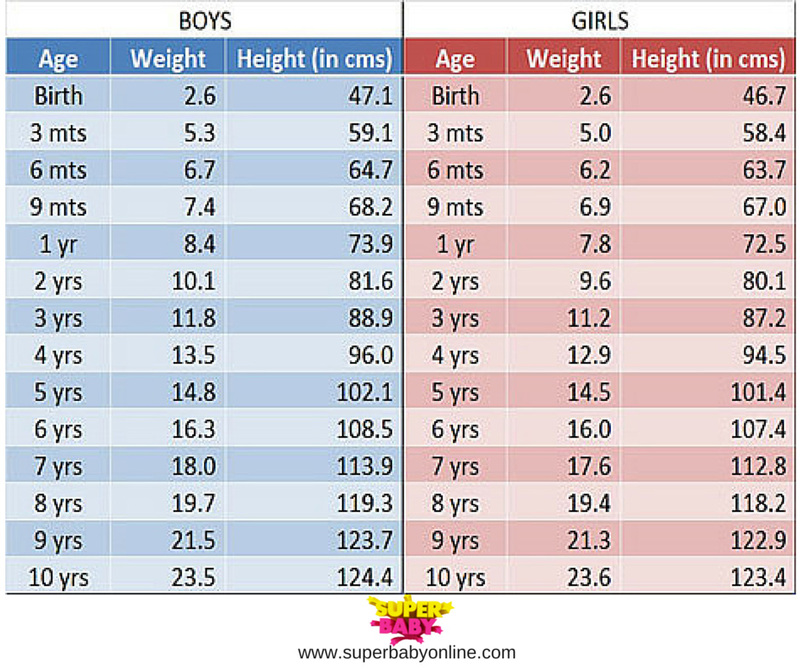 There is a lot of difference in height and weight of children at different ages. There are also significant variations in height and weight of children from different regions and communities in a vast and diverse country like India. Generally, clinics issue medical check-up cards which give a record of the various types of immunizations done; any illnesses, and height and weight are also recorded. Growth charts are also displayed on the walls of the clinic for you to check your child’s growth against the average for his age. These cards are necessary and you should keep them carefully. Schools ask for these cards (or at least the information in them) to maintain their own record of your child’s medical history. A regular, periodic check on the progress of a child’s weight and height is a good method of assessing his health and progress. It is more appropriate than making a single recording of the parameters at any single point of time. It is recommended that the child should be weighed at monthly intervals during the first year, every two months during the second year and every three months thereafter up to the age of five years.